All commonly used steels unprotected eventually decay and become useless for the originally intended purpose. During the period of decay, the efficiency of the Pivot irrigation machine is reduced and resale value is affected. The decay is noted by the existance of a thin reddish film known as “rust”. Rusting is the formation of corrosion products wich include the base metal. Corrosion products form mainly in localized electrochemical cells. The cells develop spontaneously on the surface of the metal in the presence of moisture unless the surface is protected some way. Structural design affects the rate of decay. For example, bolted joints hold moisture and corrosion products and, therefore, decay at an accelerated rate. Minute surface cracks from cells with loss of metal ions from the base of the crack. This is a form of corrosion known as pitting. The chemical characteristics of atmospheric moisture nd irrigation moisture affect the rate of corrosion. The presence of carbon dioxide, oxygen, sulfur dioxide and high acidity accelerate the rate of corrosion. The practice of Pivot operators to apply chemicals through the system also may agravate the corrosion problem. Painting steel structures is an effort to keep the metal “dry” by applying a thin coating (about 1 to 2 mils.). However, since all paints are permeable to water and oxygen, rusting eventually occurs. In order for a painting process to be effective, the metal surface must be completely free of all mill scale, rust, dirt, oil and greases. This can only be accomplished completely by the use of cleaning solutions and pickling or sand blasting. The paint coating must be quickly applied to the dry metal surface. The paint selected should be formulated to resist the anticipated atmospheric conditions. Multiple coats serve to reduce permeability. A frequently noted formulation includes zinc compounds in an effort to imitate the action of galvanized coating. The outstanding weakness of paint coatings is their comparative thinness and susceptability to mechanical damage. They are easily scraped off. This immediately exposes the bare metal to rusting and pitting. Even when the coating is intact, rust filaments (corrosive cells) occur which grow separating the paint from the surface and eventually open the metal to direct attack. Phosphate surface treatments and chromate prime coats of paint serve to limit the corrosion, but do not prevent its occurance. Epoxy coatings protect steel surfaces by providing a tightly adhering film. The film excludes oxygen, moisture and corrosive chemicals from attacking the surface. Base metals must be well prepared through cleaning and pickling or sand blasting operations. The film is formulated for resistance to chemical and atmospheric deterioration. Films may be applied electrostatically or in fluidized beds. Pipes are generally coated electrostatically. This results in an average film thickness of 4-5 mils. Film thickness over sharp edges can be reduced to 20% of the average. This would occur on sheared flanges, for example. Epoxy coatings have most of the same defects as paint coatings. They depend on completely covering the base metal. Any breaks in the coating expose the base metal to deterioration. As with paints , they are permeable to moisture and oxygen. They depend on additional film thickness and intimate adherance to the base metal to avoid rusting. Coating damage in transit or during erection must be field repaired. During cleaning operations, steel splinters can be raised. This results in a break in the coating and the formation of a corrosion cell which ultimately causes a pin hole in the pipe. In sensitive applications, the pipe is scanned electrically to locate these coating breaks. A comparatively new method for resisting atmospheric corrosion is the development of alloy steels. A typical commercial composition is as follows: 0.09 % carbon, 0.4% manganese, 0.4% copper, 0.8% chromium, 0.3% nickel and 0.09% phosphorus. These steels are useful un protected in some applications because of the formation of a protective rust film. They have been used primarily in the construction of buildings, bridges, and for architectural trim. The protective rust film forms only when exposed to cycles of alternative wetting and drying extending over a period of days. Such steels do not have any advantages when buried in soil or totally immersed in water, because the corresponding rust films formed under continuosly wet conditions are no more protective than those formed on carbon steels. Why alloying steels form a protective rust is not yet understood. It should be noted that Pivot manufacturers using Cor-Ten for their pipe wall, use painted structural steels for other components: V-jacks, truss rods, flanges, tower legs, tower bases, etc. It should also be noted that they paint the entire Pivot in a second effort to improve corrosive resistance. Galvanizing is commercial term used to describe a process by which a zinc coating is produced on steel by immersion in molten zinc. 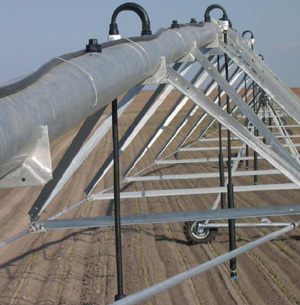 A typical galvanized pivot has about 1500 lbs. of pure zinc applied in a film thickness of about 3.5 mils. All our pipes and structural components are galvanized. The process includes tank immersion for proper cleaning, pickling, and pre-flux treatment before dipping in molten zinc at approximately 850 degrees F.
The coating is not a simple layer of zinc on steel because the molten zinc tends to dissolve the iron and steel in contact with it. Microscopic examination reveals these distinct layers composed on zinc and iron compounds. Galvanizing has been in use many years with a demonstrated capability to resist atmospheric corrosion. The estimated service life in rural areas is from 38-47 years.